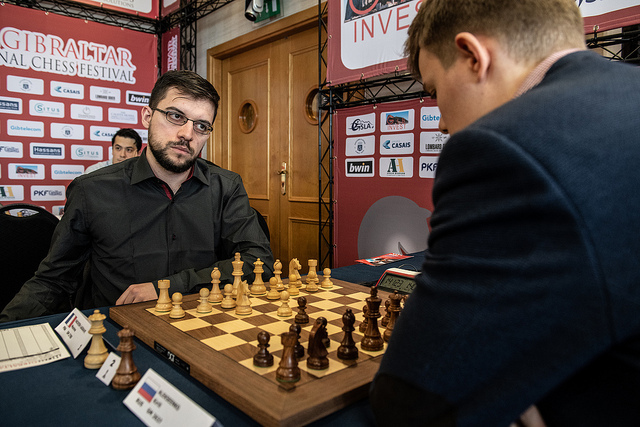 Vladislav Artemiev beat David Navara to take the sole lead going into the final round of the 2019 Gibraltar Masters. We’re going to have a first time winner this year, with only three other players still in contention: Yu Yangyi, who has White against Artemiev, and Murali Karthikeyan and Maxime Vachier-Lagrave, who face each other. The winners for the last four years - Levon Aronian and Hikaru Nakamura - are out of contention after being held to draws in the penultimate round. 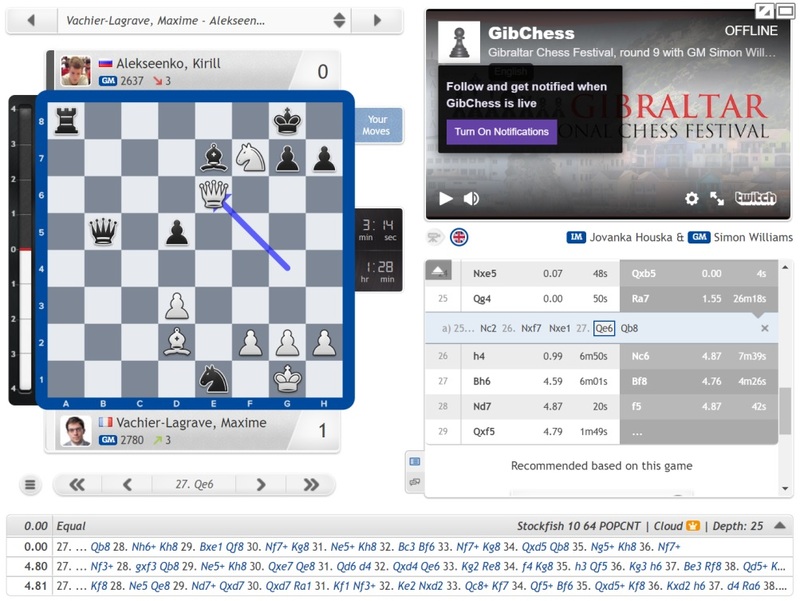 Artemiev spent 16 minutes before correctly going for 26.Bxa8! Qxa8 27.f3!. Navara’s hopes were modest – “I believed it would allow me to simplify the position and achieve a worse but tenable position” – but they were still disappointed. The rest proved simple for Vladislav, with David resigning on move 37. 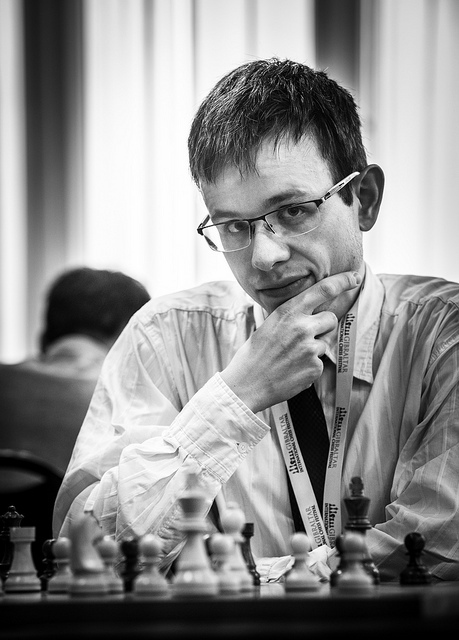 There are two star names still in the fight for first place – Maxime Vachier-Lagrave and Yu Yangyi. 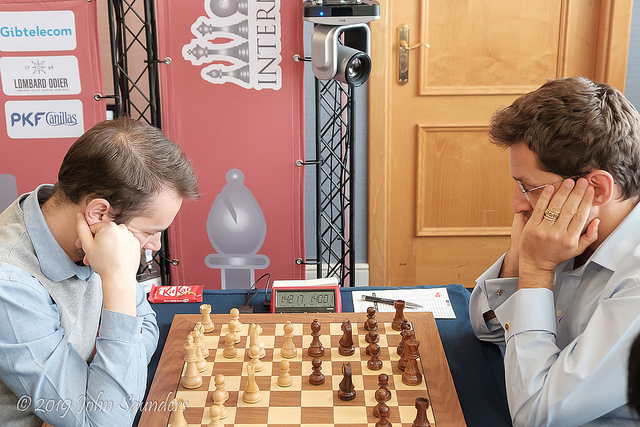 Maxime had a very easy day at the office, as he played 19.dxc6 in a Ruy Lopez, a novelty he later revealed he’d stored up for a couple of years to unleash on someone like Levon Aronian. 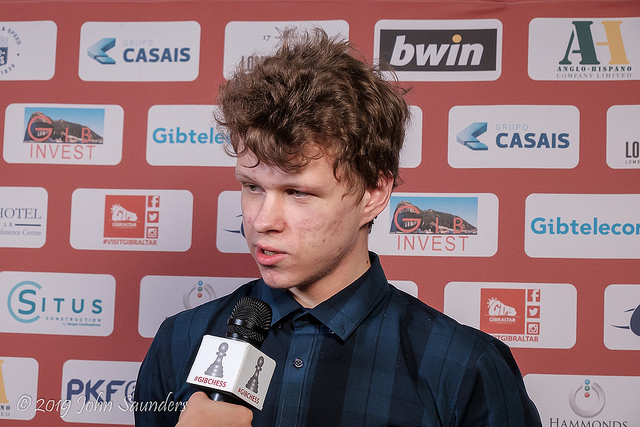 The crunch then came after 19…Nxc6 20.c4, when Kirill Alekseenko thought for an epic 56 minutes and 9 seconds before playing 20…d5! It was “a step in the right direction” said Maxime, but he also commented, “had he played this in 2 minutes instead of 55 I would have been pessimistic”. 27…Qb8!, defending against the threat of smothered mate. It seems that objectively White has nothing better than to force a draw by repetition. Yu Yangyi started the tournament with two draws, like Hikaru Nakamura, but before the final round he’s now climbed to a +5 score, claiming the scalps of Adhiban and now Le Quang Liem. The Vietnamese player became too optimistic in a tricky position and had fallen into a mating net before the time control. That result took Chinese no. 2 Yu Yangyi to within a win of the Top 10. 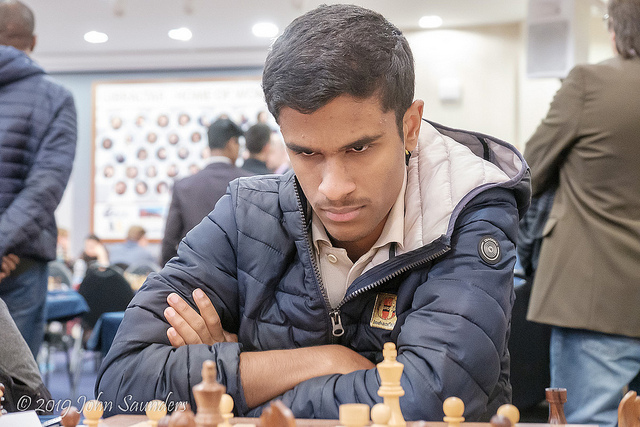 The remaining player still in the contention for the title is 19-year-old and already two-time Indian Champion Murali Karthikeyan, who lost to Hikaru Nakamura but won the two games before and four games after that loss. He followed up victory over Rauf Mamedov in Round 8 by defeating Maxim Matlakov in Round 9 in an impressive grind. It was a difficult day for many of the star players. Defending Champion Levon Aronian played the black side of an Italian against Ivan Saric, and found himself fighting for a draw that he eventually held in a study-like manner in 60 moves. Ivan is the author of a chess24 video series on the Italian. 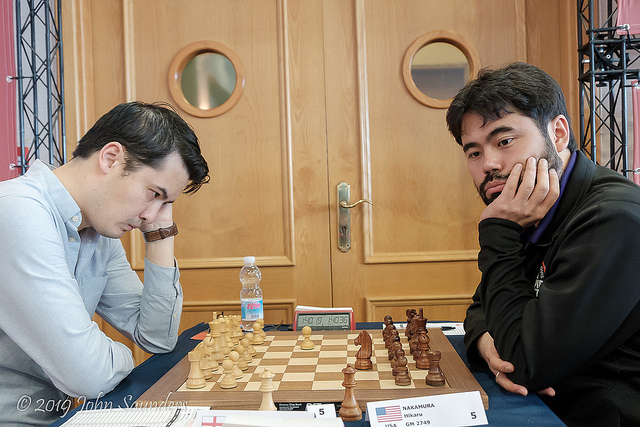 You could add Wesley So to that list, but even if he’d beaten Lalith Babu instead of drawing in 72 moves it wouldn’t have been enough for the Gibraltar debutant to join the fight for first place. 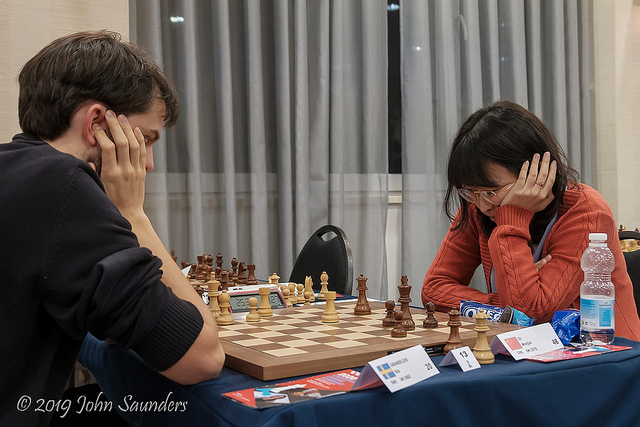 Meanwhile in the race for the £15,000 women’s top prize Ju Wenjun suffered a loss to Nils Grandelius, while Mariya Muzychuk held French GM Jules Moussard to a draw to move to 6/9. 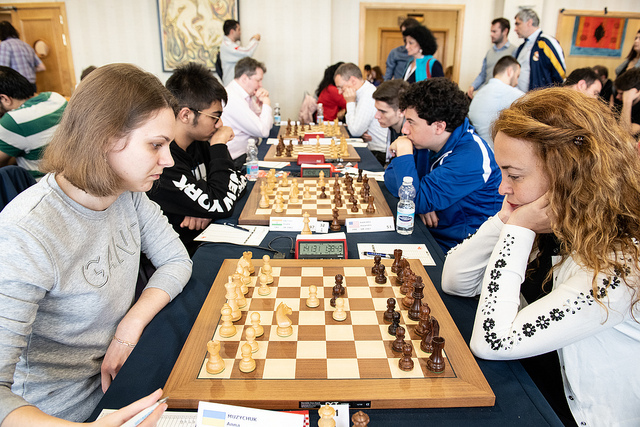 She was caught on that score by her sister Anna, who won a showdown against former Women’s World Champion Antoaneta Stefanova and Tan Zhongyi, who beat another French GM, Sebastien Maze. 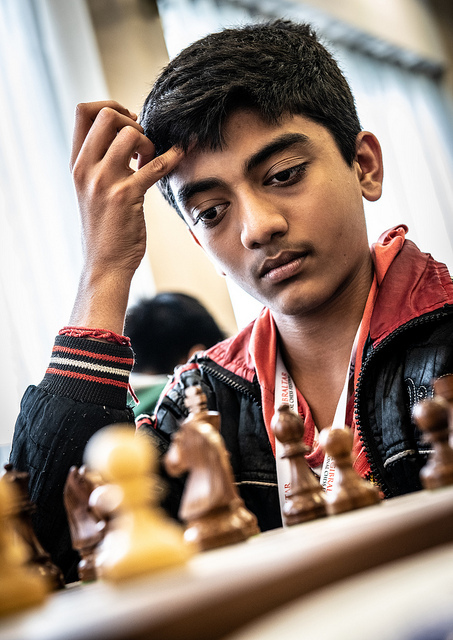 One more player on 6/9 and a tie for 18th place is the world’s youngest grandmaster, 12-year-old Gukesh, who took advantage of Argentinian GM Fernando Peralta allowing a Black passed pawn to slip through in time trouble. 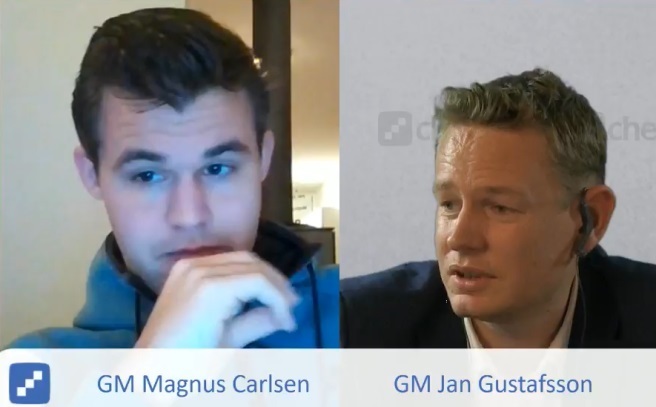 Tune in to all the action from 11:00 CET live here on chess24!